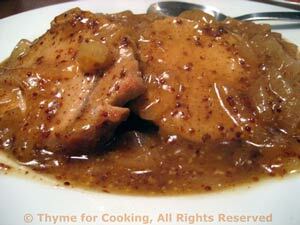 Honey Mustard Pork Chops, Thyme for Cooking's Healthy Weekly Menu. I admit, I like bacon with vegetables. It adds a bit of salt and a lot of flavor.... easily. It can be a challenge to keep vegetables interesting. Pork chops get fork-tender in no time when gently braised. I prefer thinner, boneless chops for this spicy/sweet honey mustard sauce. They stay tender and moist, and the reduced sauce makes this a lovely main course. Heat oil in nonstick skillet. Add onions and sauté until tender. Move onions to the side and add pork chops. Brown on both sides, about 10 minutes total. Add remaining ingredients, cover, reduce heat and simmer 15 minutes. Increase heat to medium-high. Uncover, remove pork and keep warm. Stir sauce well and boil until it reduces by half, about 5 minutes. Spoon over pork and serve. Boiled potatoes, smashed and fried in butter and olive oil.... A bit of salt and pepper, nothing more... These are meant to be rough, big chunks mixed with small bits, and brown. 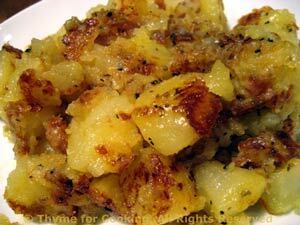 Cut potatoes into large chunks and cook in rapidly boiling water until tender, about 15 minutes. Cover the pot to start, then partially remove to prevent boiling over. When done, drain. Heat butter in a medium nonstick skillet over medium-high heat. Add potatoes, and roughly smash down with the back of a large spoon or spatula. Leave, undisturbed, 5 - 7 minutes, until browning nicely. With spatula, lift up in sections, turn and smash down again. Leave for 4 - 5 minutes and repeat. Drizzle with olive oil if you like, and leave for 5 minutes longer. Add salt and pepper, remove and serve. For years I only steamed cauliflower. I'm discovering other methods work equally well, with delicious results. In a small skillet or medium saucepan, sauté bacon until crisp. Cut cauliflower into bite size florets and stems. 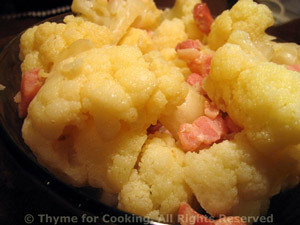 When bacon is cooked, add cauliflower, water and stir to combine. Cover and simmer on medium-low heat for 10 - 12 minutes or just until done, being careful not to overcook. Uncover pan, increase heat to cook down any remaining water and serve.